While I'd really like to see an autosave feature for the TYPO3 RTE, a new extension does the next best thing. 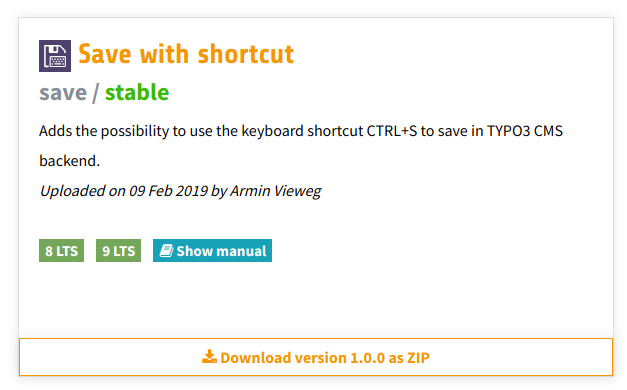 An extension for TYPO3 allows you to use the familiar keyboard shortcut for saving. I installed the Save with shortcut extension from TYPO3's extension repository. It currently works for TYPO3 versions 8 & 9. The instructions state that you must clear the system cache and reload the backend before using the extension. But I found that when using Google Chrome browser, the CTRL+S keybinding shortcut still causes the browser's save page as a file dialog to appear. This is not the desired result. I also tried it in Firefox and I still saw a save file dialog come up instead of the desired result. Perhaps this didn't work because I was logged in as an Admin user? So I created a brand new user that wasn't an admin user and I tried the CTRL+S shortcut. And it didn't work. It would be great if this extension worked for me, but for some reason I can't figure out why it won't. And I'm still looking forward to somebody creating an autosave function for TYPO3, just like Wordpress has.